How were the ‘mysterious holes’ in the Russian north formed? 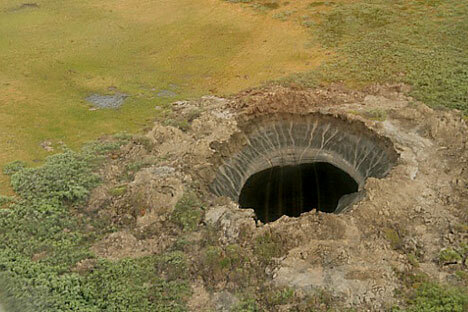 Scientists interviewed by RBTH confirm that the mysterious holes on the Yamal Peninsula that have sparked so much interest on the internet have no known analogues on land, but could indicate a serious degradation of the permafrost, with global implications. Any such holes known to science have only previously been discovered at the bottom of the Arctic seas. However, according to Doctor of Technical Sciences Vasily Bogoyavlensky from the Institute of Oil and Gas Issues at the Russian Academy of Sciences, even these have virtually never been studied. In a practical sense this means that, in the absence of fundamental research, scientists will not know the conditions in which these holes can form and the regions in which they can form. If they are sufficiently analogous to the holes in the Kara, Pechora, Barents and other seas (these are known by the scientific term ‘pockmarks’) and are formed as a result of natural gas explosions, then this could pose a significant threat. According to the scientist, the Arctic seabed has, as far as can be told, the same geological structure as that found on the Yamal Peninsula, with one exception: The ground is covered with a thick layer of permafrost, which is all but absent from the northern seas. This is a ground and rock layer, the temperature of which remains constant at below 0º C for a very long time – from 2-3,000 to several thousand years. In the permafrost zone, ground water exists as ice that can be more than 1,000 m deep. According to data from the Earth Cryosphere Institute at the Siberian Branch of the Russian Academy of Sciences, more than 70 percent of Russia is covered by a layer of permafrost, which amounts to around 12 million sq km. In the world as a whole, permafrost covers one quarter of the total landmass. Since there are hundreds and thousands of pockmarks on the seabed, this could indicate that further degradation of the permafrost would lead to new holes appearing in the future. The permafrost is a huge reservoir of greenhouse gases, and specifically of methane, which is causing the atmosphere to warm up. Since the permafrost occupies such an enormous area, the thawing of the permafrost as well as other processes have a direct effect on the global climate. According to forecasts conducted by United Nations experts, this in turn could lead to a rise in global sea levels of a meter within this century. Doctor of Geological and Minerological Sciences Marina Leibman (of the Earth Cryosphere Institute of the Siberian Branch of the Russian Academy of Sciences) supports this gas theory. A permafrost expert with more than 40 years’ experience, Marina was one of the first to arrive at the mysterious hole close to Bovanenkovo – one of the largest gas deposits in Russia. “For me the biggest surprise was that the location appeared untouched by any kind of human activity. My first thoughts were that this hole was the result of an accident that occurred whilst drilling for natural gas,” Leibman explained to RBTH. Scientists did not risk venturing down into the hole: There was a very high risk of it collapsing, but they did lower a video camera down to the bottom. There is a small lake at the bottom of the hole, formed of dirty water. As the temperature is above freezing, but the walls are frozen, this water, which is mixed with clay, is draining down the walls and collecting at the bottom. According to Leibman it could take 2-3 years for the hole to fill with water and become a lake. By all accounts, the hole could have been formed as a result of an increase in temperature in the local climate. Does this mean that the topography of the Yamal Peninsula is suited to these cavities? “It is not the case of course that the entire topography is suitable, since specific conditions need to come together in one location for this to happen. This is linked to the type of rocks found near the surface. It depends on the geological cross-section, on the gas content within the rocks, and the amount of ice,” the scientist said. Leibman explained that if the ice content is high, and the density of ice is half that of rock, processes begin to work to redistribute matter in the soil, adding that the gas would need to be at a depth accessible to warmth seeping down into the rock from above. As Leibman noted, there is a similar hole at Taymyr in northern Siberia, and in theory this could also happen in Chukotka (in the Russian Far East) but there is no reason to expect new holes to appear south of 69-70º in northern latitudes. “Around 10,000 years ago it was warmer than it is now, so the permafrost had melted in more southerly latitudes. The permafrost at these latitudes is not solid any more, but is isolated, and interrupted by river valleys and under deep lakes. Whatever needs to escape [this refers to methane - RBTH] has already escaped long ago. There is no longer any need for the gas to fracture the permafrost since it can escape via the rocks, which have thawed out,” Leibman explained. Read more: Have we passed the point of no return on climate change?